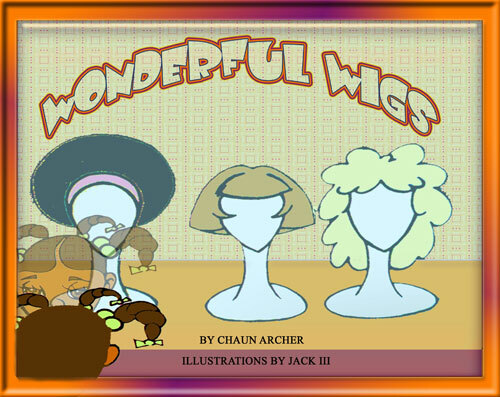 Wonderful Wigs is my first children's book, in a series of books that help parents discuss some of life's rare but difficult issues. They are helpful resources to empower and enable parents to talk to their children with confidence, if any of these issues arise. Wonderful Wigs tells a story of Aisha, an eight year old girl, reliving her experience with cancer, and the loss of her hair. Her mother takes her to a wig store to help her find something to make her feel more comfortable with her hairloss. What does she find? She realizes wigs are not so bad, but more importantly, that she doesn't need one to be beautiful. She talks about the feelings she had before, during and after treatment, and how she overcame them. It is a reassuring book that can help relieve some of the fears and questions that any child battling cancer, or a child that may have a loved one undergoing cancer treatment may have. Especially issues of hair loss, rejection, and self esteem. It is an effective tool that may help open the lines of communication between child and adult. The illustrations help to ease any discomfort you may have while trying to explain cancer to a child. It is a helpful and much needed resource and tool. It's not only good for children battling cancer, but those who may have a loved one or friend battling cancer. It answers questions that some children are afraid to ask, and helps them to be more sensitive to others situations. Now, also a Wonderful Wigs coloring and activity book. 10% of profits from the sale of this these books goes to Given Beauty an organization that gives women undergoing or recovering from cancer treatment beautiful quality wigs. $1 from all corporate sponsorship goes to St Jude's. Preview, Buy, or Sponsor a Child now at my online store. Hi Chaun! Thank you for the request. Thanks, did you do your own illustration?